Spider-Man swings through Manhattan, on his way home after an evening of fighting crime. As he moves through the city's labyrinth of skyscrapers, onlookers (and the audience) can barely catch a glimpse of him as he swings by. Finally however he stops, dropping down into the thick branches of a tree to watch and wait for the coast to clear. Once the street's prying eyes have departed, he leaps into a nearby open window where he lands on the floor with a loud thud. "Miles," a woman's voice calls from another room. "Yeah, Mom!" he replies, cringing at his discovery. "I didn't hear you come in! Dinner's ready if you're hungry." Miles Morales offers a quick "thanks" and then peels of his mask, revealing his face to the unsuspecting moviegoers. The instant that Marvel Studios and Sony Pictures Entertainment revealed that Spider-Man would be joining the Marvel Cinematic Universe, this is how I wanted it to happen. Mind you, it's something that's far from likely. 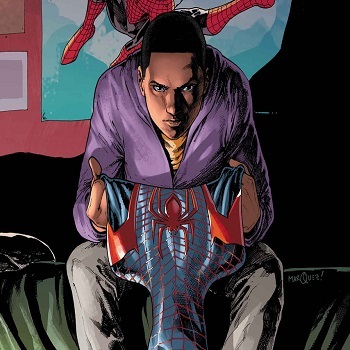 The odds of the two companies deciding to ditch Peter Parker in favor of his Ultimate Universe replacement Miles Morales are something that I could see being next to nil. Heck, Sony Pictures president Doug Belgrad practically confirmed that the new version of Spider-Man would be yet another iteration of Peter Parker. "This new level of collaboration is the perfect way to take Peter Parker's story into the future," he said. The thing is that I can't think of anything less "future"-focused than the idea of giving the world yet another take on a character that, at least in the world of films, is kind of played out. Don't get me wrong. I love Peter Parker. The thing is, we've already seen the character done well before and, if The Amazing Spider-Man movies are any indicator, creating a fresh, unique and entertaining version of Mr. Great-Power-Great-Responsibility is not an easy feat. Miles Morales, comparatively, is a character that moviegoers haven't seen before. While comic book readers are familiar with him, wider audiences might not even know he exists. Now, to a movie studio, I could see why that might seem like a bad thing. If modern movie making has demonstrated anything, after all, it's that there are certain audiences who will dole out their hard-earned dollars just to see familiar characters doing certain things. Giving moviegoers a new, different Spider-Man when they could just repackage the one people are used is the sort of the thing I could imagine risk-averse film executives laughing at. Being less well known however, also means that audiences are less likely to be fatigued by him. His story is one that, for most, will be completely fresh. The fact that he's more obscure could also give Marvel and Sony Pictures more potential freedom to create their own version of the character free from the constraints of a deep-rooted mythology. The Amazing Spider-Man tried hard to give us a more modern and contemporary version of Peter Parker, but it did so while constantly struggling against the constraints of Peter being a nerd and an outsider. Miles, as he's portrayed in the comics, shares a lot of the same characteristics as Peter but he's also much more normal. He gets his powers from a spider-bite just like Mr. Parker, but he's not a science wunderkind. He's pretty much your typical teenager, thrown into huge events through simple chance. Granted, some might enjoy the whole nerd-gets-powers fantasy that comes with Peter, but Miles' status as an every-kid could also make him more malleable to the needs of the film studios. I also think that Miles' personal narrative would simply just mesh better with the Marvel Cinematic Universe. Peter Parker's rise to heroism is one almost entirely propagated by his failure to save Uncle Ben. He gets bitten by the spider, acts like jerk for awhile and then turns around and does the right thing after his failings result in the death of his adoptive father. In other words, his most iconic moment of emotional drama is rooted in his origin story. Seeing as Marvel has already expressed its desire to avoid producing more origin story movies, Miles' more gradual rise to super-powered vigilantism would, in my opinion, work much naturally. In the comics, one of the first things that Miles does after his spider-bite powers appear is leap into a burning building (out of costume) to save a woman and a child. He's shown to be a person with an innate drive to use his powers for good. This characteristic, combined with his witnessing the self-sacrifice of the Ultimate Universe's Peter Parker, is what eventually leads him to take on the mantle of Spider-Man. It wouldn't be hard to envision a scenario where a movie version of Miles manifests his powers at the beginning of Captain America: Civil War but then sits on them until the actions of another hero inspire him to join the fray. Better yet, Miles' defining tragedies all come after the start of his double life as Spider-Man. If we go with Miles as the MCU's Spider-Man we can still have all the same Uncle Ben moments as Peter, but don't have to shoehorn them in via an awkward flashback. There is, of course, also the matter of Miles' race. 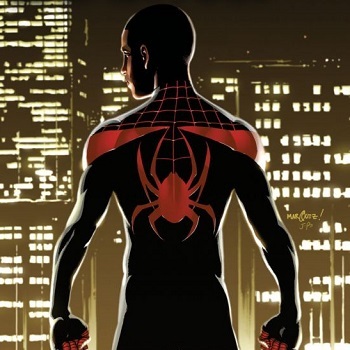 Being half-black and half-Hispanic, introducing Miles Morales as the cinematic continuity's Spider-Man would be an incredible opportunity for Marvel and Sony Pictures to add another not-Caucasian hero to the, frankly, white-washed world of the MCU. Don't get me wrong, Marvel has already taken some notable steps to correct this problem. Falcon was one of the best additions brought to the table by Captain America: The Winter Soldier. The announcement of a Black Panther movie was also a move in the right direction. We also should never forget Samuel L. Jackson's fantastic take on Nick Fury. The thing is, Falcon, Black Panther and Nick Fury are not Spider-Man. They simply don't have the name drop clout as the friendly neighborhood Spider-Man Put shortly, adding a multi-racial Spider-Man would be a much bigger move to promote MCU diversity than anything else that's been announced so far. And the thing is, even if people pitch a fit and do the stupid "Spider-Man's supposed to be white!" crap that we all know they'll do, Marvel's movies have been so successful that a Miles Morales Spider-Man movie would still have a good shot at being hit. People might like Peter Parker, but at the end of the day the guy they're buying movie tickets for is the one dressed in spandex swinging around the city on human-sized spider webs. As long as the movie's good I'm willing to bet people won't care so much about who's behind the mask.